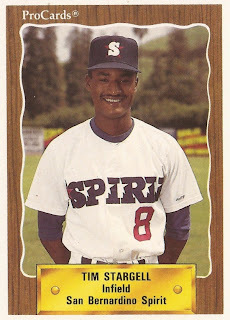 For each of Tim Stargell's first three seasons as a pro, he won MVP honors of his respective team, according to The Seattle Times. He won team MVP honors in his third season, 1990, at San Bernardino with as season that included 17 home runs, 96 RBIs and a season-capping grand slam, The Times wrote. His career, though, lasted just one more season, with Stargell making it to AA Jacksonville. But Stargell, the nephew of Hall of Famer Willie Stargell, could get no higher. Stargell's career began in 1988, taken by the Mariners in the 33rd round of the draft, out of Southern University. At Southern, Stargell hit .349, with six home runs and 25 RBIs, according to The Associated Press. Stargell spent his first year as a pro at short-season Bellingham, hitting .279, with six home runs and 22 stolen bases. In one August game, Stargell knocked in two on a triple. Stargell moved to single-A Wausau and San Bernardino in 1989, playing the majority of his games at Wausau. There, Stargell hit .278 with 12 home runs and 20 stolen bases. Then came his season at San Bernardino in 1990. By 1991, Stargell earned his shot at AA, moving up to Jacksonville. At Jacksonville, Stargell hit three home runs in 62 games. He hit one of those home runs in a May game. Stargell, though, also hit just .185, stealing eight bases. He didn't return for a fifth season.